Graham came to us on the 17th Oct our first guest for some time, for a short 2 day session , the first day started well with a number of runs from both carp and predator rods with a number of new species , unfortunatly for Graham he had just caught the last of the rain and we had very heavy rain through out the night which dropped the water temp by over 3 degrees and the bites slowed right down . 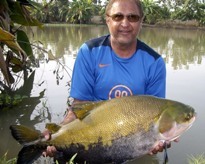 However he did finish on a high with a beautiful Julian's Golden Prize Carp. 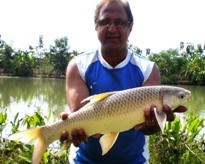 November saw Kapi a carp specialist from the Homefirth area of Yorkshire, time his first trip to Thailand very well as the rain's had now subsided and the fish had settled in to a familiar feeding pattern. He was armed with an assortment of boilies and flavourings that our fish had never seen before , but he was determined to stick it out , one rod using our tried and tested method feeder against his boilies. 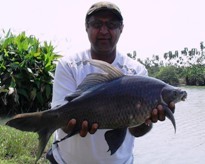 At first the method out fished his boilies but towards the end of the first week more and more species had developed a liking to his boilies including a few species of catfish , a rarer Ripsaw catfish and a beautiful Tambaqui. 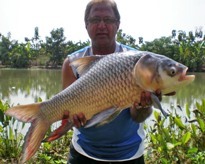 In all 35 fish 13 different species,all PB's as he had not caught any of these species before. 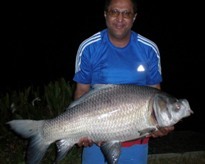 He did not manage to catch the biggest Siamese in the lake but had a number of them up to 35lb and Indian Catla Catla carp up to 37lb a trip any one would be proud of. 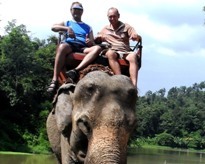 He was sorry to leave and took many fond memories of Thailand back to the ....cold UK, including an elephant ride!.